Two films into his career, after his debut Murder Party and his acclaimed follow-up Blue Ruin, writer-director Jeremy Saulnier has managed to win over critics and audiences with his suspenseful, sometimes darkly comic approach to storytelling, almost always ending with a little bit of Tarantino-style ultra-violence. However, due to their indie status, most audiences were denied a chance to see them in bigger-chain cinemas and had to discover them through other outlets like Netflix. Luckily, his third and latest film Green Room is his most accessible to date, so not only will more mainstream audiences get a chance to see what Saulnier’s work looks like on the big screen, but will also be taken aback by some of the intense and violent directions he likes to take in his work – and be all the more entertained because of it. We follow the members of The Ain’t Rights (Anton Yelchin, Alia Shawkat, Joe Cole and Callum Turner), a small-time punk rock band who are desperate for gigs to pay their way through life (we first meet them siphoning petrol from another car to fuel their broken-down mini-van, which they also seem to be living in), and are assigned to play at a remote venue somewhere in the Portland, Oregon woodland. However, it turns out the clubhouse is a meeting ground for Trump supporters neo-Nazi extremists, and after a daring performance where they cover the Dead Kennedys’ “Nazi Punks F**k Off”, they come backstage to find the corpse of a girl with a knife in her head. Prevented from leaving by the club’s fearsome owner Darcy (Patrick Stewart, chilling), who is eager to cover up the murder by any means necessary, the band and the dead girl’s friend Amber (Imogen Poots, creepily aloof) must fight for their lives if they are to escape their fearsome captors. What follows is a heavily entertaining punk grindhouse film where nothing seems to be left to the imagination, and is most certainly not for the faint-hearted. The filmmakers take every single advantage of the situation, showing us pretty much everything that could happen when a Nazi clubhouse is actively trying to kill you, whether it involves slicing arms with a machete or sending a ravenous pit bull in to do the work for you, and not once does it ever become tedious or exploitative. It’s clear that the intent is to place the audience in the same situation as the characters, one that leaves everyone increasingly stressed and terrified of what it could all be leading towards, and leave them in an intense state of panic and despair every single second we are trapped inside that room. In that regard, it most certainly works; every single trial and tribulation this band goes through against these murderous thugs, you feel every sense of paranoia and dread they are going through, you feel just as scared and on the edge as they are. Your fears are their fears, and it’s the sign of an effective movie when this is the case for anyone who watches it. Naturally, this is a very violent film – anything less would perhaps lessen the impact, in our opinion – and it can definitely get graphic and sometimes unbearable if you’re at all squeamish; for everyone else, though, it’s blissfully reminiscent of the over-the-top violence of those old grindhouse films from the 70s. Aside from the aforementioned slicing of a character’s arm, we get to see a man being disembowelled with a box-cutter, throats being ripped out by dogs, and so many gunshots to the head that you swear this was all target practise for the extreme left-wing version of the NRA. You get a lot of gore and blood for your money’s worth, but again this isn’t the kind of ultra-violence where it becomes exploitative or fetishized; it’s all part of building this heavily intense and utterly horrifying situation that the audience is made to feel just as much a part of as the characters, and Saulnier succeeds in creating a film that never lets up in just how graphic or suspenseful it can be. 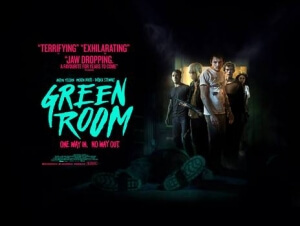 For fans of the violent thriller genre, or anyone who just wants to see a well-crafted and carefully-paced film in general, Green Room is definitely worth your time – unless you tend to faint at just the sight of blood, that is. Green Room is a highly intense and violent punk thriller that takes advantage of the situation its characters are placed in and uses them to display entertaining but never exploitative levels of gore and fear that become more unbearable, in a good way, as the story prods along at a careful and considerate pace, thanks to the slowly rising abilities of writer-director Jeremy Saulnier.